This is a highly unusual situation for me when it comes to reviewing albums for this website. It’s rare that I do book reviews and have never ever reviewed a novel. I was just going to review the brilliant eight track c.d that is part of this excellent package, but it is almost impossible to take one part or the other in isolation. I’ve followed Jason’s quite sparse recording career with keen interest ever since the two albums by his incomparable early 21st century band, ‘Star City.’ Those that are aware of the band will know that this is the group of musicians that no lesser publication than ‘No Depression’ described way back in 2001 as ‘the best twang-informed roots band you’ve never heard!’ Sadly, after those two albums they split up and Jason was lost to music for a few years but then happily resurfaced again in 2010 with the excellent ‘Sad Iron Music,’ a highly rated album, albeit different to the Star City’ albums. 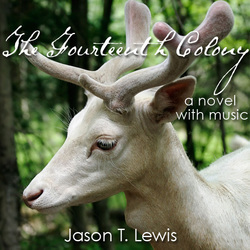 Jason wrote virtually all of the songs and was also pursuing a career as a writer of novels which is how he arrived at this tremendous story of a talented musician that didn’t get any breaks, returning to his roots in small town Virginia. His unheralded arrival is a surprise to those from his past that still remain in the town and provides a few pieces of shocking news for him. The time span covered in the story is only very brief, but seems greater because of the flashbacks, but this highly literate pice of descriptive fiction builds up a picture of several potential relationships and tells the story as a first person narrative. Jasons ability to paint pictures in words is fairly obvious from his history of songwriting but is further confirmed on reading the first page of this gripping story that would make an excellent piece of cinema. I rarely read novels now and on the odd occasions that I do, they can take an age to get through. This one was read in two sittings over the Christmas holiday and is one of those books that is difficult to put down. It is a style of writing that enables you to understand some of the characters and to sympathise with their attitudes even when what they want seems to be at odds with their lives. You almost feel that you should reach out and try to put them straight, such is the sympathy engendered by this tremendous piece of writing. The main characters are all from ‘the wrong side of the tracks’ but despite limited education have a world weary intelligence that keeps them fighting against all odds, despite very little optimism. I don’t want to give anymore of the story away but suffice to say that when I had finished reading the book there was a little buzz that made me feel I had just read something a bit special. Do yourself a favour and get the book and c.d, you won’t regret it. There is a great talent at work here and it’s about time real genuine talent won out, rather than that manufactured by many of the big record companies in this 21st century.